This is the second in a six-part series. 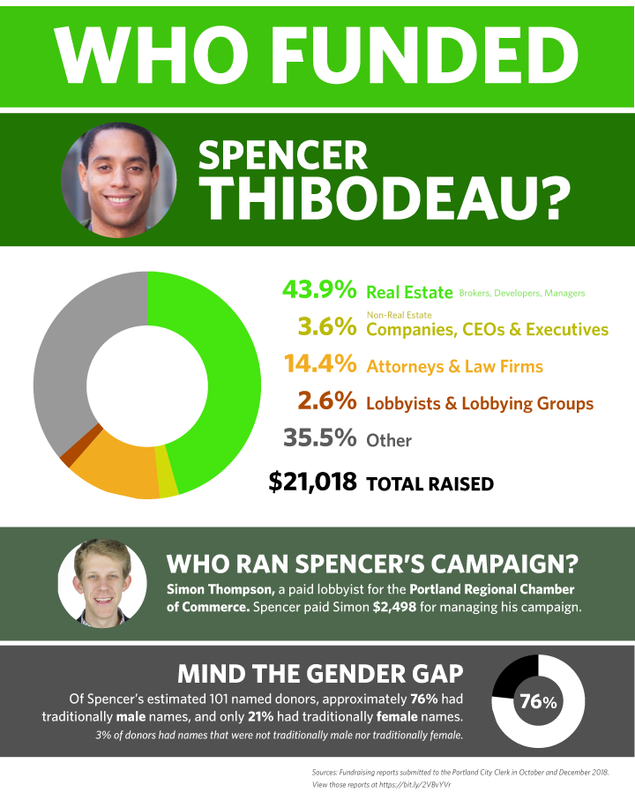 Today we’re looking at city councilor and mayoral candidate Spencer Thibodeau. We will also be looking at Nick Mavodones, Belinda Ray, Jon Torsch, Emily Figdor, and Jeanne Swanton in this series. Brandon Mazer currently serves as Vice-Chair of the City of Portland Planning Board. Sean Dundon currently serves as Chair of the City of Portland Planning Board. Toby McGrath is a registered lobbyist, who currently represents Maine Professionals for Regulating Marijuana and Stonewall Kitchen, among others. Michael Saxl is a registered lobbyist, and currently represents Visa, Harvard Pilgrim Healthcare, AT&T, and the Maine State Chamber of Commerce, among others. He has also previously represented Trans Canada Pipelines, Ltd.
James Cohen is a registered lobbyist, and currently represents Emera Energy, Summit Natural Gas, and Verizon, among others. Tom Watson is the owner of Port Property Management. Christopher O’Neil is a registered lobbyist, and currently represents Delta Dental. He has previously represented State Farm Insurance and Bank of America. David Eaton is a Senior Originator at Housing and Health Care Finance, LLC — a healthcare real estate firm. Barry Sheff is a Senior Principal and Senior Project Manager at Woodward & Curran, where he focuses on public sector infrastructure and private sector real estate development.